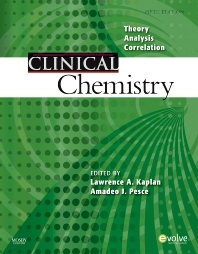 Full coverage of clinical chemistry from experts in the field gives you a solid foundation for transferring from theory to practice. Clear explanations and user-friendly features make this a textbook that you can continue to use as a reference on the job. Key terms listed at the beginning of each chapter help you master relevant vocabulary. Section objectives highlight the most important content and provide goals for each chapter. 5. Laboratory Analysis of Hemoglobin Variants NEW! 10. Laboratory Approaches to Serology Testing NEW! 32. Viral Hepatitis: Diagnosis and Monitoring NEW!